It all started with a map. Several maps, to be fair. I've been fiddling with the idea of modular cartography since a while, and although it's far from being an uncharted field (pun intended), there still was a lack of products for regional maps with a decent quality around. Out of the blue, I decided to experiment more in this field, and shared the results on socials. The reaction was surprisingly good, and many asked what game was associated with that. Working from a very different perspective than my usual, I drafted the rules with a result already in mind: a tile-placement game capable of generating countless maps, focusing more on topology rather than relying on resource management or workers placement. 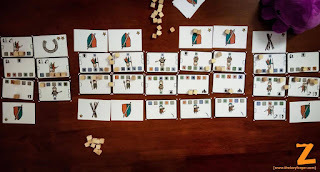 Three prototype iterations followed, both refining the mechanics and the whole tile placement geometry issues: cool designs could work in a very little number of combinations, and optimizing the joining rules isn't easy. 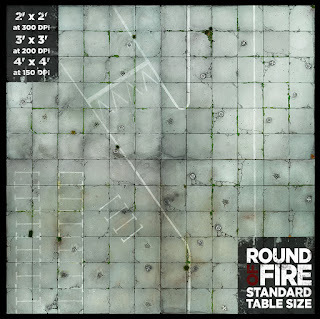 A Round of Fire Battlemat! 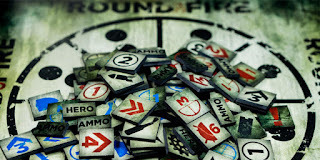 A place for games and other very serious things.